Achieving the financial future you want is no different than producing a good yield. You need to plant the right seeds and harvest them. With our experience in agricultural accounting, we know how to help you reach your short-term, and more importantly, your long term goals. If your hard work is not reflected in your profit, our monthly bookkeeping services can track of your finances more accurately. If your net income is not where it should be, it may be because costs are not being tracked through bookkeeping. Monthly financials with a detailed breakdown of costs can result in significant savings on taxes, payroll, or other expenses. At McDonald & Associates, we know that working with agriculture clients means more than simply providing accounting and tax services. It means having an in-depth understanding of farm operations and the complex regulations involved. Because several McDonald team members have farming backgrounds, we know how to help you operate a more profitable business. As a farmer, you work hard to produce a good crop. As the AG financial experts, we can relieve you of the burden of doing your taxes and accounting, while assuring your finances are always accurate and compliant – and your farm is as profitable as possible. Many of our AG clients using QuickBooks TM have discovered how easy it is to make errors while inputting data. As QuickBooks TM Pro Advisors, we can find those errors during the preparation of monthly or quarterly financial statements preventing costly year end taxes and penalties. Depending on your needs, we can input transactions directly to our computer program to generate reports. Or you can input the data into QuickBooks TM and we will make any necessary adjustments. If you are only seeing an accountant for a yearly tax return, you are missing the value of tax planning. The savings in McDonald & Associates’ proactive tax planning easily outweighs the cost of quarterly or monthly financial statements. Working with a true AG accounting expert means decisions are based on up-to-date and accurate financial information. Because suppliers and banks require this information, it’s accuracy can affect your operations. Also, accurate financial information increases your profits and allows you to begin a sound retirement plan for a secure future. 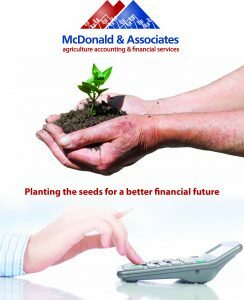 For more information check out our agricultural accounting brochure! Please contact me about your agricultural accounting accounting and financial services.